Outdoor Fountain With Geometric Styling and Multiple Basins. Stuff Points: Earn 375 points when you buy this stuff. Bold and sturdy looking, the geometric styling on this fountain is sure to please. Multiple natural colored pots sit atop a thick, geometrically designed tower. The rectangular shapes of the tower nicely contrast the more rounded and natural shapes of the pots. Simple natural coloring gives the whole thing a look that goes well indoors or out. It will blend well with any decor, and it easily fits in outside. Three smaller pots will rest above one larger one, and they each have their own little shelf that is formed out of the vertical tower folding perpendicular. There are copper spouts toward the bottom of the upper pots, and the water will flow from there. The triple stream effect this gives offers a unique look, and the copper coloring adds a nice accent. Water will flow from the top pot, and will continue down the tower, filling and flowing through each one. This is a totally self contained unit, so once the water completes it's journey, it will be pumped back up to cycle through again. The continuous flow will add a nice effect to any indoor or outdoor setting, and would be a great addition to anyone's home. Despite looking like it was carved from stone, this fountain is actually made out of fiberglass. THis gives it a nice natural look, but it also makes it far more affordable and easy to manage. You will be able to easily place it right where you want it due to the lightweight construction, but it will still be quite durable. THe sturdy exterior is able to hold up through almost any weather conditions, so it will stay looking like new for years to come. A high quality pump is included to complete the package, and it comes with a full, one year warranty. The set up on this unit is easy, and maintenance is almost nonexistent. You do need to plug it in somewhere, but beyond that there is not much to assemble or set up. Because it continuously cycles the same water, once you get it filled, and plugged in, you will be all but ready to enjoy your relaxing new fountain. Perfect for the patio, deck or by the pool, this fountain would enhance any backyard decor. Due to limited splashing, you can also use this model inside if you want to. It is one of the taller models we carry, so if you are looking for something that will really stand out, look no further. The GIL812 Three Tier Pot Fountain is a great choice. It will upgrade the appearance of any space, but will also add relaxing background noise to soothe and relax. Order Yours Today! 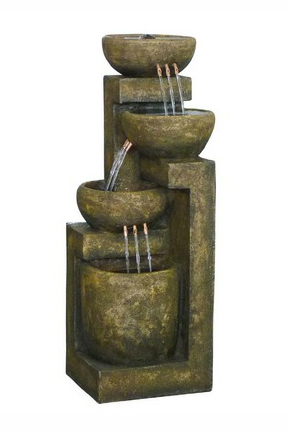 Three Tier Pot Fountain - A water feature with geometric styling that is made from fiberglass resin. Perfect for any space outdoors or in! Order Yours Today!